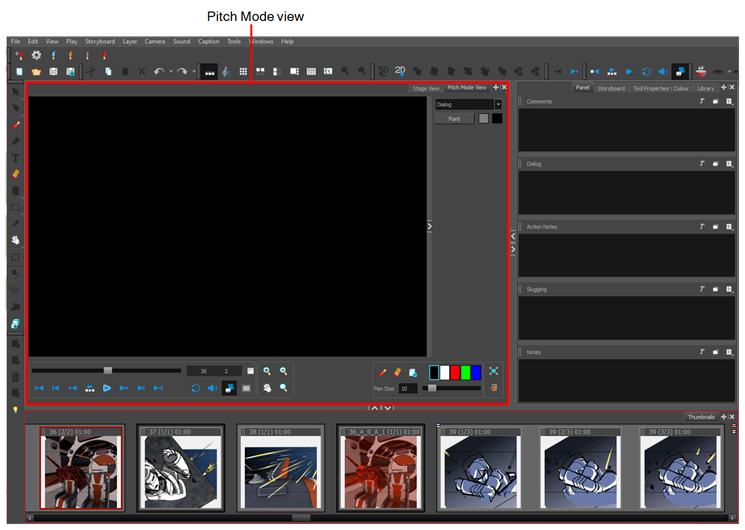 The Pitch Mode view is optimized for pitching your storyboard. When using the Pitch Mode view, the tools and functions that cannot be used are dimmed. You will no longer have access to your drawing layers. To return to the normal mode, you must close the Pitch Mode view. There is also a Pitch Mode workspace which is similar the Pitch Mode view. This workspace occupies the entire screen and provides access only to a certain number of tools—see Pitch Mode Workspace. For task information on this view, see About Pitching the Storyboard. ‣ In the Panel view, click the Add View button and select Pitch Mode View.